For science to respond to the needs and challenges of society, citizens must be engaged. 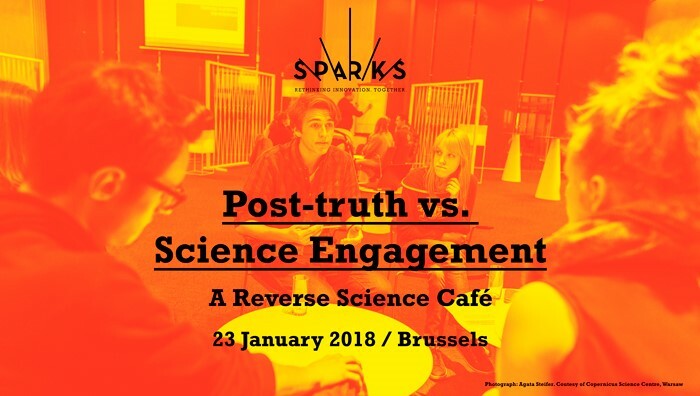 The citizen-science dialogue that forms the basis of this engagement in research is under threat from the post-truth phenomenon. We find ourselves in times when objective facts lose influence to emotions and personal beliefs in shaping public opinion. How can we understand the implications of this social/political context; what approaches are needed to tackle this challenge and continue engaging the public? Join the conversation at our Reverse Science Café. Sit down with people from diverse social, cultural, political and business groups and join forces in finding ways to increase trust in evidence-based research and critical thinking. Unlike in a regular science café where experts deliver a talk, a Reverse Science Café invites participants to become the experts and experts to become the listeners. All will work together in small groups to formulate solutions to the challenge of making research and innovation more diverse, inclusive and open in the post-truth context. This is a unique chance to engage with experts in different fields over a cup of coffee or a glass of wine.